After the latest Flash Player update, any emote or pet (but not armors, weapons, or other items) that made noise would make that noise... FOREVER... until you either turned sound off or refreshed your browser. 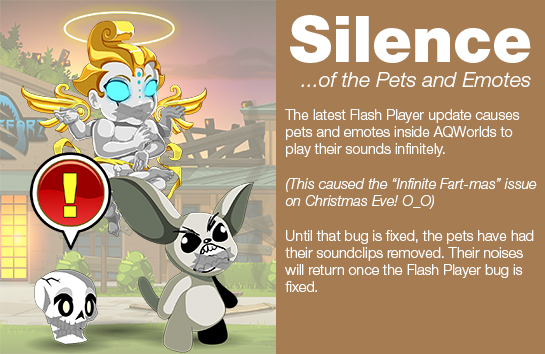 We are digging into OUR sound engine to see what interactions are happening with the new Flash Player. But until we can find and change things on our end, the quickest fix to keep your ears whole and happy is to remove sounds from the affected pets/emotes. The /fart emote is the only affected emote. If you find any other items or emotes experiencing the "infinite noise" issue, please report it on the Bug Tracker. * The team is SO dedicated that they worked from 3 - 5:30 AM testing, then again on 11 AM - 1 PM to put the fixes live. Many thanks to all of you who helped us and reported information!